Just after lunch yesterday, Kelley and I heard a huge ‘boom’ and felt the house quiver. “Tree,” I thought, or a ship explosion in the Sound. Then another ‘boom’. We went outside: nothing, no smoke, no obvious gaps among the huge trees, no dogs barking at earthquake-triggered car alarms just…nothing. So we shrugged, went back to what we were doing. Later, we found out it was a sonic boom made by F-15 fighters scrambled out of Portland at 1:38 pm when some doofus in a Cessna floatplane bumbled into the no-fly zone surrounding President Obama. Obama was visiting to raise money for Sen. Patty Murray. I hope the Cessnator either loses his license for not checking restrictions before flying, or at least has to pay for the jet fuel. Or maybe he should donate rides to kids as community service. Or… Well, what would you suggest for such an idiot? I'd say suspend his license for awhile. But wow, what a cool photo! Never seen one of those before. So that's what it was. We heard it here in Haller Lake and hoped that it was the next-door neighbor's house blowing up (no such luck!) Jennifer? 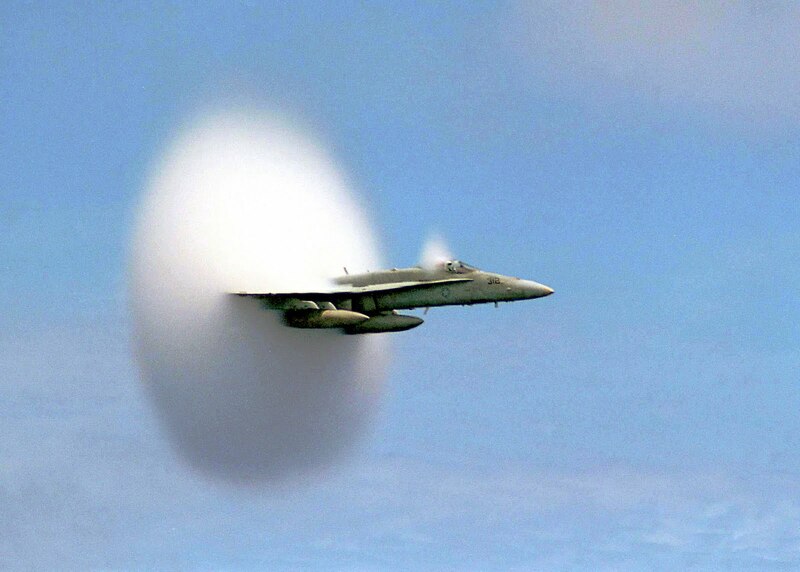 How do you think anyone could take that picture at mach 1 speed? Hmmm. “Through the viewfinder of his camera, Ensign John Gay could see the fighter plane drop from the sky heading toward the port side of the aircraft carrier Constellation. At 1,000 feet, the pilot drops the F/A-18C Hornet to increase his speed to 750 mph, vapor flickering off the curved surfaces of the plane. In the precise moment a cloud in the shape of a farm-fresh egg forms around the Hornet 200 yards from the carrier, its engines rippling the Pacific Ocean just 75 feet below, Gay hears an explosion and snaps his camera shutter once. “I clicked the same time I heard the boom, and I knew I had it”, Gay said. Gay selected his Nikon 90 S, one of the five 35 mm cameras he owns. He set his 80-300 mm zoom lens on 300 mm, set his shutter speed at 1/1000 of a second with an aperture setting of F5.6. “I put it on full manual, focus and exposure,” Gay said. “I tell young photographers who are into automatic everything, you aren't going to get that shot on auto. And here it is on video! Sadly, no sound. That video is pretty cool. Thanks for the link. I've been taught that the the most important thing for an in-air pilot is flying, or, more specifically, keeping the plane in the air. All other stuff (looking where you're going and communicating about what you are doing) is secondary. So without knowing what caused this person to fly into no-fly zone, I would hesitate to do anything to him. MallMonkey, very good point. There again, he admits he knew nothing of the restricted zone because he didn't bother checking that morning. Stacy, I saw that. People around here are fast!